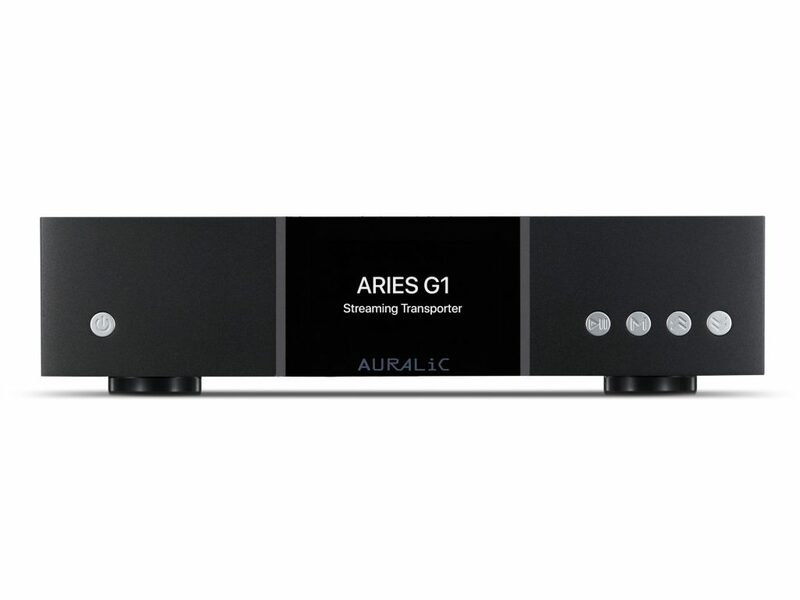 Back in Issue 96 (HERE), Managing Editor Dave Clark put the AURALiC ARIES G2 Streaming Transporter ($3999) through its paces, praising that unit for its relative ease-of-use and naturally unforced, but also superbly detailed, sound. 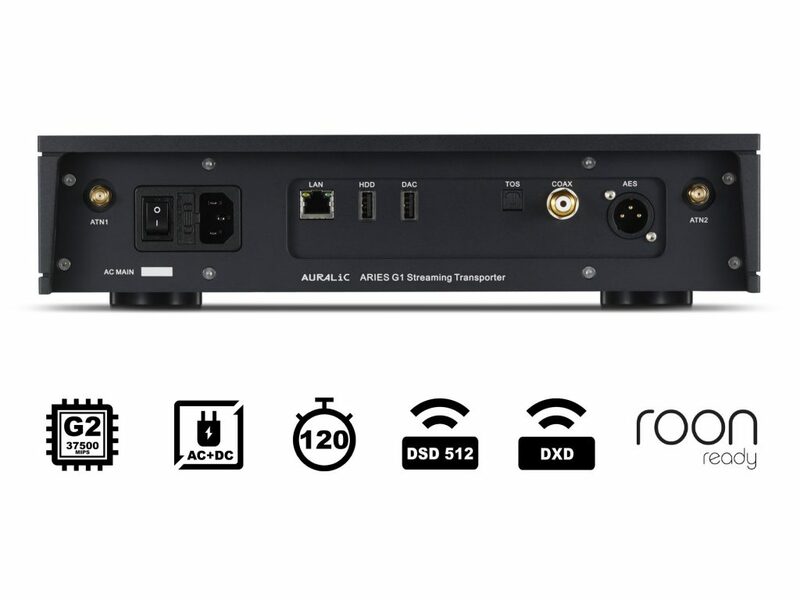 More recently, Alex Brinkman, AURALiC North America’s Marketing Director, reached out to see if I wanted to review the new AURALiC ARIES G1 wireless streaming transporter, a device that borrows heavily from the G2 platform, but at a much lower cost ($2499). Given my overall enthusiasm for this segment of the marketplace, I agreed. For those readers who live under bridges, the Beijing-based AURALiC has been around since 2008. 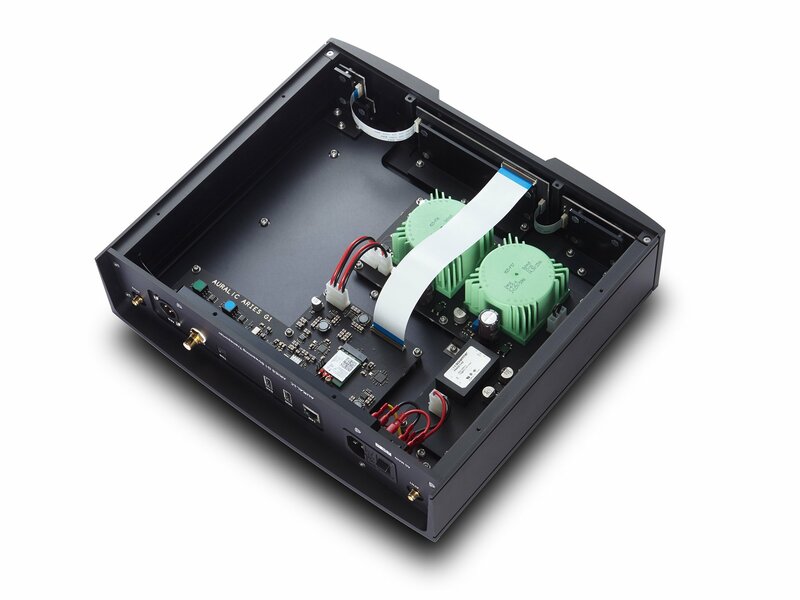 The firm first captured the attention of the high-end community with its wonderful ARIES and VEGA series of streaming transports and DACs. The ambitious MERAK class D mono-block amplifiers soon followed, arguing with utter conviction that AURALiC was a major new force in high end, and here to stay. Positive Feedback has favorably reviewed several AURALiC products over the past several years, and I’m happy to report that with this review, the trend continues. 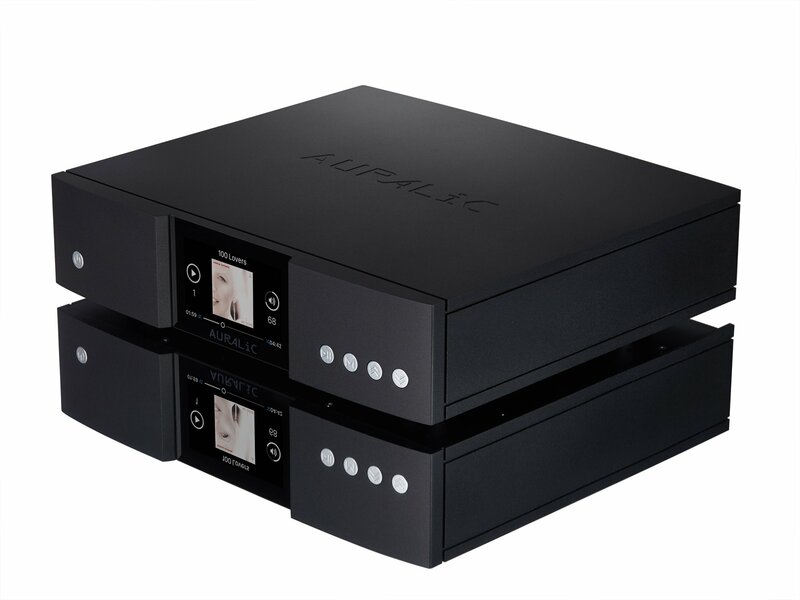 AURALiC recently re-imagined its top-flight ARIES class streaming transports, as well as its VEGA series streaming and stand-alone DACs, from the ground up. The reference line now also includes the newly introduced LEO GX Reference Master Digital Clock, a unit that appears to straddle both the ARIES and VEGA product lines. The first obvious departure from the Gen 1 AURALiC product lineup is the liberal use of black CNC-machined, billet grade aluminum enclosures for the new ARIES and VEGA models. While the old models with their beautifully sculpted aluminum faceplates (colored silver) were certainly striking, in my humble opinion, the new black solid aluminum models look stunning. The G1 feels like it should cost considerably more than the modest tariff that AURALiC charges. Twice the system memory (2GB) and data storage (8GB), and a giant 1GB memory cache. The point to take away from these advances is that digital storage and playback platforms continue to advance at a seemingly exponential rate, with new developments and performance gains appearing faster than reviewers (and perhaps consumers) can meaningfully track. On the other hand, with companies like AURALiC, Lumin, and a host of others offering these improvements at real-world prices, I don’t see how anyone has reason to complain. I found the AURALiC ARIES G1 wireless streaming transporter quite easy to set up. With Alex on the phone (something AURALiC strongly recommends), I quickly downloaded the Lightening DS operational app, hooked up Ethernet and power cables to get the G1 up and running, and attached an outboard hard drive (mine a Samsung 1TB solid state self-powered unit) to feed digital files to the transport. You should expect your dealer to replace Alex (or another AURALiC employee) as the company point-of-contact and technical adviser. Please note that the G1 only works with self-powered hard drives, a fact I quickly discovered when I tried to attach a non-self-powered external drive to the G1 via the USB input port. The onboard USB port is not itself powered (for noise-reduction reasons I assume), meaning that the hard drive you choose must have its own internal power supply, or use an external wall-wart PSU (meaning a typical NAS will suffice – Ed.). Initially I used my reference Audio Sensibility Statement Silver AES/EBU digital cable to connect the G1 to the outboard DAC, this followed by a run of Kubala-Sosna’s superb Sensation USB digital cable for the remainder of the review. It took a few minutes for the G1 to cache the digital files stored on my hard drive (including album art and associated metadata), but once completed, I could initiate playback immediately. To sweeten the deal, Alex put me in touch with the folks at Qobuz, the French music streaming service. I secured from them a temporary license which allowed me to stream hi-def digital files via Qobuz’s Beta-test streaming platform for the remainder of the review. I will report on my experience with the Qobuz platform after I have gotten that system’s full measure. For the past several years, I have used Lumin’s wonderful D1 audiophile network music player as my reference digital source component (this typically feeding my Cambridge Audio Azur 851D DAC). I love the Lumin (review HERE) because it’s easy to use, relatively easy to set up, and sounds great. But, as a review component, it has a few shortcomings. First, it boasts limited connectivity options, meaning only 1 SPDIF coaxial output, but no USB output slot. If you want to stream DSD music files, you must use the D1’s on-board DAC. Don’t get me wrong, the D1 DAC sounds great, especially when decoding DSD files, but DAC technology has improved quite a bit these past three years, and the D1 chip set is no longer state-of-the-art. Second, although I continue to praise the Lumin for its superb sound, its presentation is not without a bit of added sonic flavor. To wit, the D1 boasts a warm, full-bodied sonic footprint that I just love, but if I am being honest with myself and you, it is not the most accurate of perspectives. I’m happy to report that new ARIES G1 wireless streaming transporter is even easier to set up and use than the D1, features world-class connectivity, and sounds great. The G1’s sonic prowess owes to its adamant refusal to editorialize, its stellar transparency to sources, DACs, and cables, its superb dynamic scaling, and its remarkable imaging and sound-staging capabilities. When challenged with the wispy lyricism of Tom Jobim’s imminently approachable “Photograph” from Grammy award-winning saxophonist Joe Henderson’s 1995 release Double Rainbow (Verve), the G1 captures the sweet and sour bite of Henderson’s tenor and his signature mastery of harmonic overtones as realistically as I have ever heard. Without ambiguity, one can both sense and hear the fluttering of moist air through Henderson’s mouthpiece, his delicate fingerings along with the associated “plop” of leather key pads against the instrument’s brass tone holes, and the billowing waves of moist air that bloomed almost like liquid out of the saxophone’s bell. Voices also benefit from the G1’s superbly balanced approach. Melody Gardot’s dark and sultry voice serves as the perfect vehicle for the soulful jazz-pop musings she prefers, her recorded output a veritable catalogue of introspective laments over broken relationships and shattered romantic expectations. The G1 captures the purity and sweetness of her voice, its liquid purity, and earthy timbre sublimely. Just check out Gardot’s standout 2009 release My One and Only Thrill (Verve), particularly the mournful “The Rain,” to see and hear what I mean! The sense of 3D palpability on display is positively eerie. What the G1 does (and does not do) that so impresses me is to present the music as an almost raw, naked, and unfiltered event. The G1 simply steps aside, in a way that most components don’t, and lets the recording and the performers do the talking. When I first heard the G1, my initial reaction was to conclude (wrongly) that the transport was guilty of slightly bleaching out tonal colors and vocal and instrumental textures and highlighting recorded detail and upper-frequency content. Closer listening revealed, especially after a little transport burn-in (including burning in the KB Sensation USB cable), that the G1 was simply stripping away the low-level sweeteners that made the Lumin D1 sound so damn addictive, but also not entirely realistic. So, on a personal favorite and long-term reference like Domino (from Polish trumpeter Tomaz Stanko’s 1999 release From the Green Hill (ECM)), the G1 possesses the uncanny ability to place Stanko, saxophonist John Surman, and the rest of the band directly in my listening room as living, breathing, wholly interactive 3D musicians, not 2-dimensional simulacrums. What the G1 doesn’t do is bathe the entire affair in a subtle halo of moist air like the D1, an artifact that sounds oh so enticing, but also a bit unnatural. Mind you, with the G1 in tow, music’s upper octaves sound every bit as resolute and airy, the mids every bit as life-like and holographic, and the bass every bit as impressively taut, deep, and palpably detailed (perhaps more so) as they do with the D1, but with an even greater degree of transparency, clarity, and transient snap. I would be remiss if I failed to mention the stellar contribution of the superb Mola Mola Kaluga preamp and the Bruno Putzey-designed on-board DAC here. The preamp/DAC combo is a model of transparency, producing, in concert with the ARIES G1, the most preternaturally revealing, uber-dynamic, explosive digital playback I have ever encountered. In many ways, I’m still coming to terms with everything the G1 (and associated DAC) is capable of (including a more detailed assessment of its performance when paired with the excellent Qobuz streaming platform, impressions to follow soon). But I did promise Alex that I would try to get this preview/review out before AXPONA 2019, and to the best of my ability, I aim to be a man of my word (sadly, my father died recently, meaning that my review schedule has gone off track a bit, for which I apologize to all impacted parties). (Editor’s note – we received this review 15 mins prior to our departure to AXPONA and were unable to meet Mr. Brown’s deadline; today is the best we could accomplish.) For the time being, let me say only this: in the here and now, and for not a lot of do-re-me, the G1 delivers reference-caliber sound. Mated to a world-class DAC like the Kaluga on-board unit, it has redefined for me what digital sound from streaming sources is capable of. It should give manufacturers of units costing two, three, four, or even five times its fair tariff more than a few things to worry about at night, and already likely has. It is my new digital refence and a “shoe-in” for a Positive Feedback 2019 Writers’ Choice award.